The most expensive Turkish film ever made, FETIH (or CONQUEST) 1453 is a historical epic about the Osman Turks’ successful siege of Constantinople in the year 1453, leading to the replacement of the Byzantine Empire with the Ottoman and the renaming of the city to Istanbul. Somewhat unsurprisingly, it is depicted entirely from the Turkish point of view, centered around Sultan Mehmet as the protagonist – and in Turkey, the film was released at exactly 14:53. Rather than hire a compatriot for this patriotic film, however, director Faruk Aksoy sought the services of one BENJAMIN WALLFISCH to provide the score. WALLFISCH is best-known in the film score industry for his orchestration work, notably on several of DARIO MARIANELLI’S works. 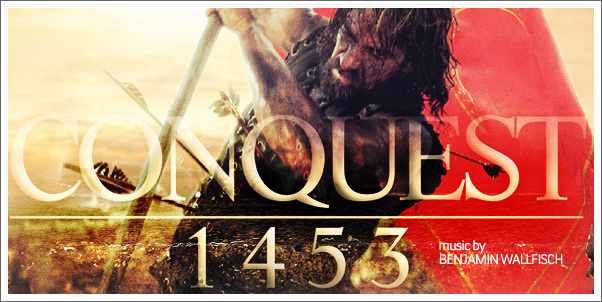 CONQUEST 1453 marks his first major effort as a composer, and it is a promising one indeed.